Day 4 is actually going to the dogs. Literally. I’m had my share of pets throughout the years. I barely remember my first dog, Yuki, in the Philippines. I do remember “Sweety” the cat, who was not so sweet whenever you’re heading down the stairs and takes a swipe at your ankle, making you jump out of sheer fear of being touched from under the stairs. 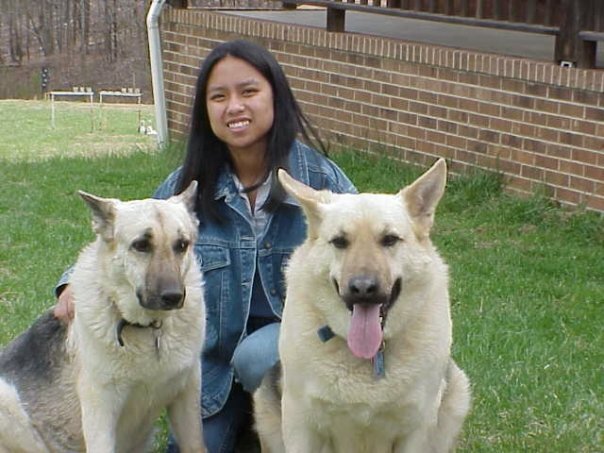 My family then had Polgas “Pol” and Princess, the two GSDs that secured my love for the breed. While in Tennessee, I had Jernt, Sox, and Kogen; all long-haired cats. Today, I have Syren to claim as my own and Duke, who is an extension of my husband. Without my experience(s) with pets, I would not know how to be responsible for a child, my future child(ren), and I wouldn’t have a sense of duty at home. There are some people who simply treat their pets as toys, others who treat their pets as real children, and then, you have “pet parents”. I like to consider myself as one of them, yet I can’t help but shy away from the community that has allowed themselves be called “pet parents”. The community is good and great, but I end up arguing for the sake of the pet more than the sake of the human in some situations, and I’m not going to go there in this article. My cats (not counting devil cat, Sweety) taught me to always stay on my toes, to always be on guard and alert because you never know what’s around the corner. Jernt had this bad habit of hiding under the couch and scratching your feet when you got too close. Sox had this evil streak that mixed with his angelic composure: He would lie at your feet while you were on the computer then BAM! You’d get claw marks up and down your legs from him trying to “climb” you to get on your lap for cuddles. Kogen was a whole new level of crazy. He took “stay alert” on a whole new level. He would hide at the very top of hanging cabinets and the ledge above the door and wait for you to be under him before he pounced on your head. Dare devil kitty was my image of Altaire and Ezio from Assassin’s Creed, taking the leap of faith from heights of *shiver*… Yes, I’m still afraid of heights. Now, my dogs… They were/are the ones who have taught me the most. Pol and Princess were the best. When it came down to putting them down, I know my parents had a hard time with the task as I did. However, the event(s) taught me that it’s not about what the humans want in the end. It’s really all about the pet’s health and quality of life. Princess was suffering with an enlarged tumor in her stomach that caused her to eat little to nothing during meal times. Pol’s brain “snapped”, causing him to have the canine version of Alzheimer’s, which is scarier than the human version as he was growling and snapping at people he would normally NOT try to bite. I struggled a bit as a teenager with “responsibility” with Pol and Princess (P&P). Walk, feed, brush, pick up poo…. The usual groan and moan of kids, right? I still struggle with the brushing with Syren. I get 10 minutes in, and she struts away, shaking me off. I don’t like chasing after her with a brush. I’ll explain in a bit. What P&P really taught me was how important companionship is. When Princess was put to sleep, Pol cried for her, went searching for her in the garage. It wasn’t until after my Mama got rid of her pillow that her loss hit him. He was always so playful and puppy-like with her around being the serious lady she was. When she was gone, he was still playful, but you could tell that his puppy days were officially gone. Whenever I was home alone, he was more like a legit guard dog. It wouldn’t be until one of my parents were home that he’s loosen up again. Dogs are truly a “pack” mentality creature, and P&P showed me that much. Duke ‘n Syren are no different than P&P really. Once they realized that Mom and Dad were serious about them getting along, they bonded quickly, and now, they move like a pack that it gets a bit intimidating when I’m the one walking them alone. My current canine duo nailed me in the head with what I didn’t learn with P&P: Responsibility. While my husband is in charge of the cleanups and afternoon walks, I’ve got morning walks, meals, brushing, and any accidents that may occur in the house. Syren’s still a work in progress from her past, and this is why brushing at home becomes a test of wills and patience. She used to hate grooming brushes, and when she decides that she’s done, she’s done. I have a feeling that she was hit with brushes before I got her. It’s been a long four years of recovery for her, and Duke has helped her a lot. Time and patience are a must with these two, and boy, do they test mine! They’ve turned me into a homebody and prepped me to become a real mom. While I scold them when they’re bad and reward them when they’re good, they do remind me that they are not my real children and require a different sense of control that I’ve seen myself accept and mentally scold other “pet parents” for not accepting. That given sense of controlled responsibility from Duke ‘n Syren is a hefty weight, and something that my husband and I try to discuss and avoid at the same time, and it makes me think about P&P whenever it knocks on my door. Overall, I’m truly grateful to have been given so many opportunities to be a “pet parent”. I have an understanding of responsibility and appreciation… and yes, patience because of all the animals I’ve had to privilege to care for. I also know how to let go and accept death because of them, and how to keep the hilarious memories when they do pass. Day 4 is definitely for the four-legged friends and family in my life and memories. This entry was posted in Journal and tagged 30 Days, canine, cats, challenge, control, Day 4, dogs, Duke, grateful, lessons, let go, patience, pet parent, pets, Pol, Princess, responsibility, Syren, thankful, Thanksgiving. Bookmark the permalink.